"Chris Meehan and his Redneck Friends is the perfect festival band embracing many forms of music, including Cajun, Western Swing and a large helping of rock n' roll.... the line-up reads like Irish Music's hall of fame" - Rory O'Connor, Festival Promoter, Sligo Live. Ana Leddy,Ide Leddy, Mary Roche (vocals). "Chris Meehan's characteristic exuberance is detectable right through this colourful collection of Country Music. There is a great natural feel to the songs and the recording carries the stamp of Jim Rooney's fresh, no nonsense production. Performed with affection and altogether charming, listening to it is a pleasurable journey"
- Donal Lunny, (Planxty, The Bothy Band and Moving Hearts). Chris Meehan and his Redneck Friends are a 10-piece country band who were founded in 1982, making their debut that year at the Ballisodare Folk Festival. Writing about them at the time, in In Dublin magazine, Finbar Boyle commented "After Christy Moore's set the marquee emptied out, with the result that most of the audience missed the best act of the weekend". Later that year the band performed a series of memorable concerts at the Project Arts Centre, in Dublin with special guest Mary Black (singing Country) performing with the band. 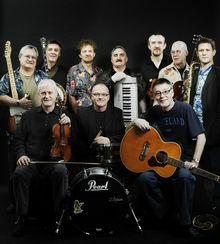 Throughout the 80s they appeared at many festivals throughout Ireland including the Galway Arts Festival and the Cork Folk Festival, as well as featuring as the closing act each year at the Clifden Country Blues Festival. Many illustrious guest artists such as John Prine, Mary Black, Mike Scott, Mich Hanly, Freddie White and Philip Donnelly performed with the band from time to time. Having vanished from the scene for over a decade, the band made a welcome return in 2009 with the release of their CD "Dancing in the Kitchen" produced by Nashville producer Jim Rooney who along with Nancy Griffith, won a Grammy for her best selling album, "Other Voices, Other Rooms". Reviewed in The Ticket (Irish Times) the band's album was described as "an Irish album which, with some flourish, nails the essence of Americana".